DVSM, L.L.C. v. Endeavour Capital Mining Fund L.P. Defendant: Endeavour Capital Mining Fund L.P. The adidas “Three-Stripe” crusade continues, this time against Ecco Shoes. 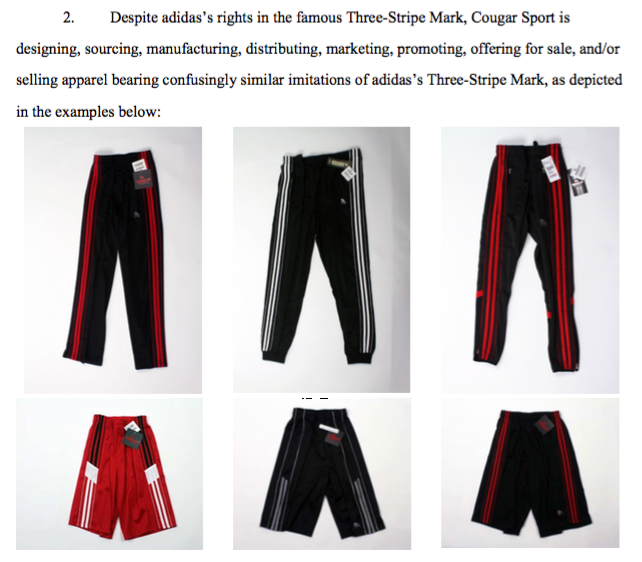 adidas is back with more “Three-Stripe” litigation, this time against Cougar Sport, a New York-based clothing company selling apparel with four stripes (2 light, 2 dark). adidas has a history of attempting to expand its “Three-Stripe” trademark rights beyond, well, just three stripes. Three can also mean 2 stripes and, if adidas has its way here, 4 stripes. The Three-Stripe mark is so famous and distinctive, as adidas frequently reminds us in its Complaint, there must certainly be an argument made that consumers would immediately recognize that 2 and 4-stripe apparel are obviously NOT adidas products. adidas America Inc. et al v. Cougar Sport Inc.